For some time now I've been looking for a way to modernize and improve the ignition systems on my old bikes. I've seen pointless systems advertised in the neighborhood of $400. Unfortunately these are custom built for specific models and $400 is a lot of money. You can still buy a lot of points and condensers for $400 and try finding one of these new systems that will fit on a CA95, CB200, or even a CB77. So I got to thinking about how my dad, an electrical engineer, built transistorized ignition systems for our racers back in the early 60's. These were the "hot setup" until the more expensive Capacitor Discharge systems came along a few years later. I remembered that with transistorized systems the points lasted forever and you got a little hotter spark that would fire plugs that were too fouled to fire with the conventional systems. The other good thing about these systems was that they were small, inexpensive, and bolted on without any modifications to the existing system. All you had to do was unplug the condenser and plug in the transistorized module. Some people even left the condenser in place so they could quickly switch back on forth between the transistorized and convention systems. 30 to 40 year old point sets are getting harder to find and more expensive. A lot of us can't afford $400 for a custom pointless system and do not want to make modifications to our old original classic bikes. In many cases the engines in these bikes are not as fresh as they once where and could use a little hotter spark, especially after sitting for several months. Custom built pointless systems are only available for very few models. So, I have done a little research and come up with a system that will work with almost any conventional system. The only limitation is that the coil you use must have 3 ohms or greater resistance. All the old Hondas I've checked meet this requirement. The system also includes a built in red LED that indicates when the points opens which makes accurate static timing a breeze. Currently I'm running the system on a 1974 Honda CB200 and 1970 Honda CL175. They are working perfectly. 180 degree crankshaft models (2 sets of points, like most CL77's and CB77's) will require two modules. Visit the Kirk Engines website for more information. 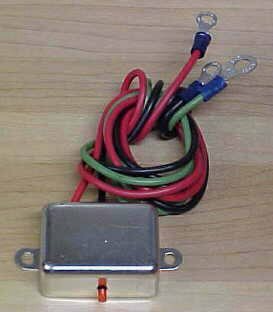 The transistorized ignition system is call the "Point Saver".